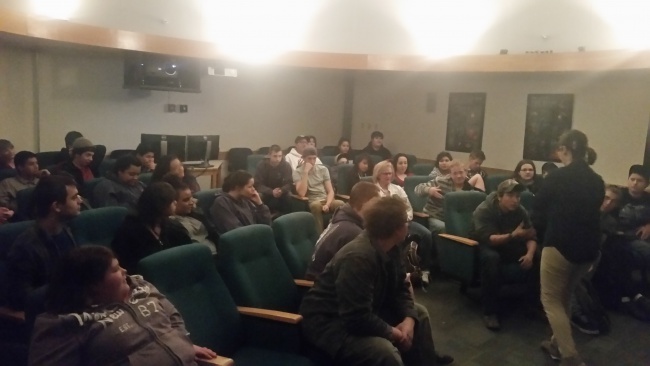 Brandon Barth, our Earth Science teacher, took his students to the planetarium at UVU on January 7th. At the planetarium students were instructed by Physics Professor Phil Matheson. Brandon’s Earth Science students were shown a comparison of sizes between the planets in our solar system with our own sun, and then a comparison of the size of our sun to other stars in the galaxy. This got a great reaction out of the students. “When the lights went down and all the stars came up on the dome of the planetarium, all at once the students said, “Whoooooaaaaa!” and then someone called out, “best field trip ever!” stated Barth. Brandon had taught them about this in his own class, but seeing it on a flat projector screen in a classroom compared to a giant dome planetarium is completely different! They ended the trip by getting to touch and hold a real meteorite! It looked small but it is extremely heavy, about 12 pounds!